A track crew works on upgrading the Amtrak rail line between Dearborn and Kalamazoo. Photo by Steve Sobel. Amtrak on March 10 , 2014 outlined its infrastructure plans for 2014, which will include installation of positive train control (PTC) and the start of a major construction project to upgrade the Northeast Corridor’s high-speed rail service. This year, Amtrak will continue its “aggressive” program to install PTC on an additional 1,200 track miles beyond the 530 track miles where it already has in operation some Amtrak-owned sections of the Northeast Corridor and all of its Michigan Line, Amtrak officials said in a press release. Amtrak also is working to obtain the needed radio spectrum to transmit data critical to operating PTC systems in the new areas. On the Northeast Corridor, the railroad will kick off major construction work on a 23-mile section between Trenton and New Brunswick, N.J., to increase train speed from 135 mph to 160 mph and improve reliability. The project will entail upgrading track and electrical and signal systems to support the higher speeds, as well as reconfiguring track switches at Penn Station in New York City to mitigate congestion. Americans with Disabilities Act (ADA) construction continuing at eight stations in three states, new ADA construction at 21 stations in eight additional states and the completion of ADA-related design work at 61 stations in 20 states. Planning elements of the Gateway Program to expand track, tunnel and station capacity between Newark, N.J., and Penn Station in New York City; ongoing construction of a concrete casement through the Hudson Yards commercial development project to preserve a possible pathway for a future Hudson River Tunnel into Manhattan; and design work for replacing major Northeast Corridor and century-old assets, such as the Susquehanna River Bridge in Maryland, the Pelham Bay Bridge in New York, the Connecticut River Bridge in Connecticut and the B&P Tunnel in Maryland. 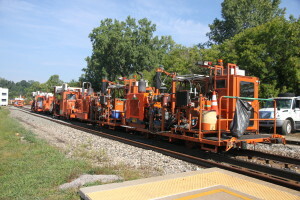 Installing and replacing nearly 165,000 ties, 23 miles of rail, and several dozen track switches, turnouts and interlockings; upgrading numerous sections of electrical and signal and systems along the Northeast and Keystone Corridors; and performing various maintenance projects on owned property in Chicago, New Orleans and elsewhere. In addition, Amtrak forces will perform significant work as part of state-led projects to upgrade track and signal systems between Kalamazoo and Dearborn, Mich.; Poughkeepsie and Albany, N.Y., and New Haven, Conn., and Springfield, Mass.